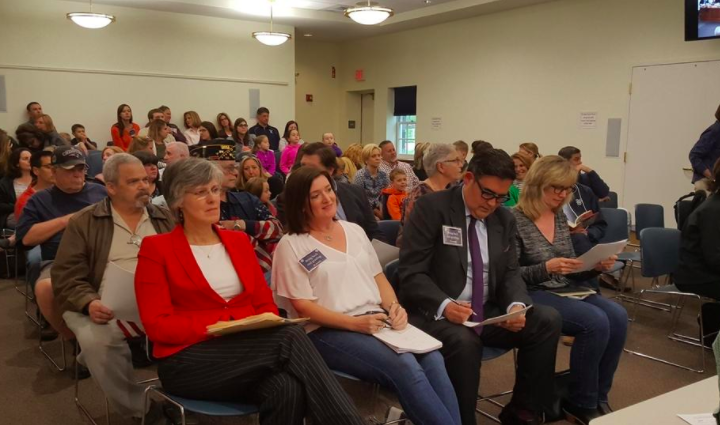 A large crowd of parents, community members and teachers turn out to Wednesday night's York School Committee hearing, at which proficiency-based learning was discussed. YORK, Maine — York High School teacher Matt Convery told the York School Committee Wednesday night that as a York taxpayer, teacher and parent of a YHS freshman, he has “hit the trifecta” as a person affected by the school’s proficiency-based system instituted this year. He was among a number of people who spoke to the committee, including parents both in support of and opposed to proficiency-based learning — and particularly a grading system instituted this year intended to reflect PBL but that many say they find confusing. At the same meeting, school administrators announced a survey that was mounted on Tuesday and that already has 237 respondents, seeking parent input on the grading system. Moreover, they announced that they will be instituting a more traditional grading system in the fall and took measure to revamp the system for this year’s freshmen. The school department is under the mandate of a 2012 state law to provide a proficiency-based diploma to students graduating in 2021, this year’s freshman class. York has worked to create the framework for that during the past 18 months or so, while some school districts began shortly after the law passed. Some parents are particularly concerned that the proficiency-based grading system adopted for freshman doesn’t accurately reflect achievement and is likely a disadvantage to students when applying to colleges. Rather, they say, the school should also adopt a traditional 1-100 system – which Principal Karl Francis announced last night they would do. State Rep. Heidi Sampson of Sanford, a member of the Legislature’s Education Committee and a critic of proficiency-based learning, also spoke. She said “parents feel silenced” on this issue. Teachers also have not spoken up until recently, she said, when many submitted testimony to her committee on several bills on this topic. “A proficiency-based diploma is the law; proficiency-based education is not the law. Adopting a proficiency-based education is not required, yet schools are deceptively convinced” that it is. Francis said the school will adopt a dual system starting next fall, with both the proficiency based and traditional grading. “We value both,” he said.